40% Off Markdowns At Disney Store As Low As $1.99! You are here: Home / Great Deals / 40% Off Markdowns At Disney Store As Low As $1.99! We all love Disney and now is the time to grab all of those special souvenirs, shirts, toys and more on sale! 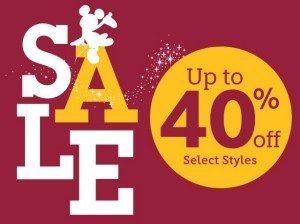 40% Off Markdowns At Disney Store As Low As $1.99! Don’t miss out on your chance to get things like Monsters Inc. & Monsters University plates, cups and sets starting at only $1.99! Stuffed Disney Characters as low as $2.39! T-Shirts, Pajamas, Hoodies and fleece throws starting at only $6.99! This is the time to stock up for birthdays, Easter Baskets, Vacation surprises or even Christmas! Head over to The Disney Store today and shop these great sale prices!